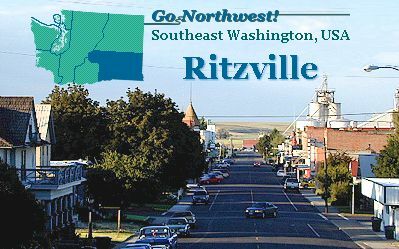 Ritzville, the seat of Adams County, lies in the heartland of eastern Washington agriculture. The prominent grain elevators link the town to the surrounding wheat fields, and indicate Ritzville remains an important milling and shipping center for dryland wheat. Indeed, the Washington Association of Wheat Growers is located here. Look for wheat rates posted on a chalkboard in the front window of the U.S. Department of Agriculture office on Main Street. In 1881, the arrival of the Northern Pacific Railway ensured Ritzville's place as a agricultural shipping center, and fostered the development of the town. When Adams County was declared in 1883, Ritzville was named the county seat - not a difficult decision, as it was the only town in the county at the time. Over the next couple of decades, many many fine turn-of-the-century homes and downtown buildings were constructed. This was a boom time for Ritzville and it proudly declared itself "the largest wheat receiving station in the world." Despite a major blaze in1888 that ravaged original wooden buildings, the downtown area remains marvelously intact, and restoration projects continue. Ritzville remains modestly prosperous, although the advent of irrigation has seen nearby Othello grow to twice the size of Ritzville. With the Germanic town of Leavenworth so prominent on the tourist map, it might come as a surprise to learn that Ritzville was actually settled by a good proportion of German-Russian immigrants. Noting street names such as "Bauman" and "Rosenoff", will give you hint of this heritage. As late as World War II, two of the towns eight churches were German-speaking. Philip Ritz founded a homestead here in 1878, and gave his name to the site. Downtown has two blocks of fine brick storefronts, as well as a Carnegie Library, and an art deco Ritz movie theatre. In fact the downtown district was placed on the National Register of Historic Places in 1990. In the photo at left, you can see the H. E. Gritman Building, on Main Street, with its corner tower. The swimming pool at the nicely maintained city park on the eastern side of town, is a welcome respite for those traveling through hot, summertime eastern Washington.